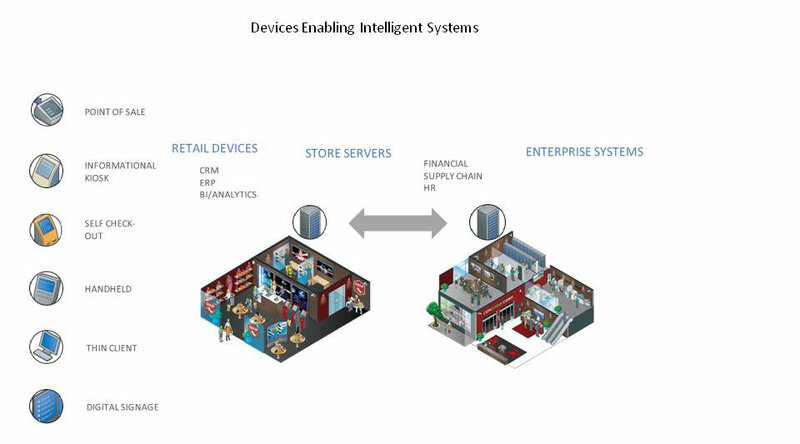 Retail Supply Chain - ComponentSoft, Inc. Retail Supply Chain - ComponentSoft, Inc.
To start, intelligent devices capture data securely and enable informed decision making at the point of impact. Device types will range in form factor and use depending on the industry and application. But they are all generating data which is no longer just stored on the device but rather connected and shared. After data is gathered, information flows to a corporations back-end systems where it is processed and analyzed. These systems can be either in the cloud or on premise. It’s here where the data is being stored, shared and analyzed to drive intelligence. Once the data is collected, then the most important part of the cycle occurs, business intelligence. Now the data is translated into new insights that can be used to create value and improve customer, employee and partner interactions. That insight can then be fed back through the corporations systems to drive new behavior and then ultimately back to the devices themselves to drive change at the point of engagement. ItemSight consists of a suite of applications that have been developed on a highly scalable, services oriented architecture platform from Microsoft, designed specifically to deliver flexibility, ease of integration, and an Intelligent Systems framework at the lowest possible total cost of ownership. Retailers are implementing strategies to address the needs of the Connected Customer, creating experiences that can fluidly flow between online and in-store experiences.